Coloured plastic cards can be used for all of the applications that fully printed cards can be used for. They are a cost effective solution when small numbers of cards are required (i.e. fewer than the minimum cost effective run size for fully printed cards). Ecardz will recommend a suitable overprint colour for your base card colour of choice. Most colours are also available with options of magnetic stripe. When choosing a plain background coloured card either ID card, membership card or Loyalty card it is best to select lighter background colours if you wish to overprint in black foil. For darker colours white, silver or gold foil is recommended. Coloured foils will not print well over a black card, for example: blue or red text will not be seen and it is best to use one of the three recommended colours for dark cards. These cards are not suitable for printing as Identification cards which require a photograph to be printed – it is best to use plain white cards for this purpose. Some logos can be reproduced as monocolour images, contact Ecardz for an evaluation of your logo if you are thinking of overprinting it in a single colour on your cards. Cards conform to ISO Standards 7810-1995 (E) and 7810-1990 (E). The coloured cards are made of PVC plastic and have a sheer gloss laminate overlay on both sides which allows for cardholder details to be added. In appearance the cards resemble banking cards in size and shape with rounded corners. 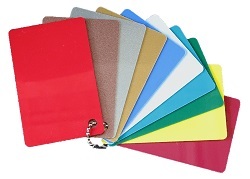 If you require coloured plastic cards give us a call today.